The United States Sports Academy recently bolstered its commitment to global sport education through a successful tour of nations by President and CEO Dr. T.J. Rosandich dedicated to expanding the Academy’s positive impact around the world. Rosandich, who has been central to the Academy’s international programs for more than 30 years, made a month-long journey ending in early February that included meetings with key leaders in sport, education and government in China, Malaysia, Switzerland, Thailand, and the United Arab Emirates. The following is an update on some key projects with the nations visited. Jinda Dechpimor, director of human development for the Sports Authority of Thailand, left, and United States Sports Academy President Dr. T.J. Rosandich sign the agreement to go forward with the 2017 International Certification Program. The Academy’s longtime relationship with Thailand to educate sports leaders in that country is continuing this year as the Academy is conducting its International Certification in Sports Coaching (ICSC) and International Certification in Sports Management (ICSM) programs in Bangkok, programs that have been in place more than a decade. 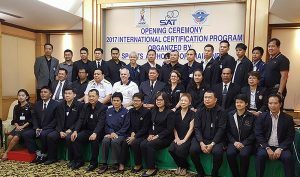 Thai students, officials of the Sports Authority of Thailand (SAT), and United States Sports Academy faculty recently gathered to celebrate the start of the 2017 International Certification Program. Approximately 50 students annually are drawn from the Sports Authority of Thailand (SAT) and its affiliated sport organizations around the country to attend each of the certification programs, with a total of 100 students involved each year. Following the conclusion of the classroom portion of the program, which is provided by Academy National Faculty, the SAT selects the best students from each program for a special study tour of sport in America. A delegation of approximately 15 students and administrators from the SAT takes part in an educational tour of various sports organizations and venues for two weeks from coast to coast in the United States, including a visit to the Academy. Dr. Khalid M. Al Hashimi, left, managing director of the United Arab Emirates Football Association Academy, and United States Sports Academy President Dr. T.J. Rosandich, address leading sport club and association leaders in Dubai on the importance of sports education in preparing employees for positions in sports organizations. 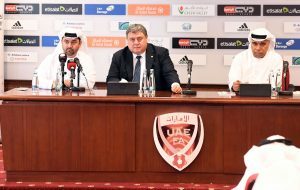 The Academy continues to play a key role in the enhancement of football (soccer) in the United Arab Emirates (UAE) under a cooperative effort to train football administrators through a Football Club Operators License Program with the United Arab Emirates Football Association (UAEFA). The collaboration has led to the development of the Football Association Academy for Sports Management (FAASM), known as the Football Association Academy (FAA). This effort includes football certification programs that offer professional preparation and training designed to meet the needs of coaches, athletes, administrators and operatives at all levels in the UAE football club system. The FAA began offering classes in February 2016. 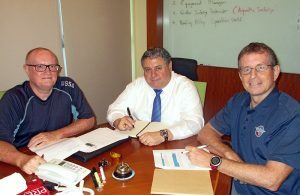 United States Sports Academy President Dr. T.J. Rosandich, center, meets for a planning session on the International Diploma in Physical Education and Sport Coaching (IDPESC) program in Malaysia with William “Bill” Price, left, chief information officer for USSA-Malaysia, and Dr. Jeffrey McClung, program coordinator for USSA-Malaysia. The Academy’s work in Malaysia to enhance the quality of physical education teaching and sport coaching there continues to pay dividends. Since 2012, more than 2,200 teachers and coaches have been awarded diplomas for successfully completing the rigorous training program to improve their professional skills. Graduates of the International Diploma in Physical Education and Sport Coaching (IDPESC) program in turn improve the lives of tens of thousands of students under their influence. Under the IDPESC program, the Academy’s faculty provide 10 modules of classroom instruction, each a week in duration, at numerous sites throughout the country. This is followed by a mentorship through which the participants are expected to satisfy a series of assignments to implement at their schools the lessons learned in the classroom. For example, the program has led to the successful physical fitness testing of more than 150,000 Malaysian boys and girls across all ages that has provided vital information to national policy-makers on the state of the health of the nation’s youth. It is anticipated that the IDPESC program in Malaysia will continue this spring with a new group of participants. United States Sports Academy President Dr. T.J. Rosandich, left, meets with the Shanghai Sports Bureau to discuss the International Sport Diploma program. Current plans are for the International Diploma in Sports Coaching (IDSC) to be taught in Shanghai in early 2018. 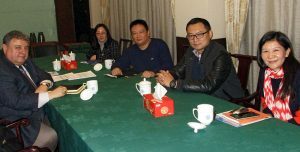 In the People’s Republic of China, the Academy president met with officials of the Capital University of Physical Education and Sports (CUPES), the Federation of University Sports of China (FUSC) and additional sports leaders in Beijing and Shanghai. In Shanghai, discussions focused on the future extension of the International Diploma in Sports Coaching (IDSC) program. Conducted by the Academy and the Shanghai Administration of Sports (SAS), the program provides classroom instruction, experiential learning, and educational travel to the United States for former elite athletes in the Shanghai area to prepare them for careers in coaching and athletic related fields. 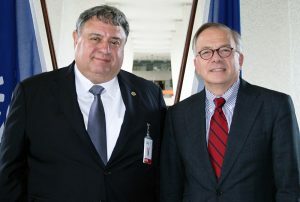 United States Sports Academy President Dr. T.J. Rosandich meets with Dr. Giovanni DiCola, Special Advisor-Multilateral Cooperation Department of the International Labour Organization (ILO), in the ILO Headquarters in Geneva, Switzerland. Dr. DiCola is a member of the Academy’s Board of Visitors and is currently working with the institution to plan a certificate program on sustainability in sports. The Academy president met with several key international sport and education leaders in Switzerland to discuss sport education initiatives. Organizations included the International Olympic Committee (IOC), the Union Cycliste Internationale (UCI); the European University Business School; and the International Labor Organization (ILO), whose interest in sport lies in its potential to elevate humanity through helping the United Nations achieve its Sustainable Development Goals (SDGs). The Academy is currently in discussions with these organizations regarding future cooperative educational efforts.  Based in Daphne, Ala., the United States Sports Academy is an independent, non-profit, accredited, special mission sports university created to serve the nation and world with programs in instruction, research, and service. The role of the Academy is to prepare men and women for careers in the profession of sports. It offers bachelor’s, master’s and doctoral degree programs as well as certificate programs. For more information about the Academy, call (251) 626-3303 or visit www.ussa.edu.